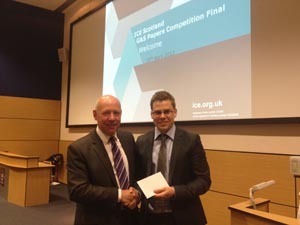 Congratulations to David Connolly, a postgraduate student in the Institute for Infrastructure and Environment, who has won 1st prize in the Institution of Civil Engineers (ICE) Paper Competition Final in Dundee on 30th April 2012. The three judges made their decision based on his written paper, his oral presentation and his ability to answer searching questions. David was representing Edinburgh after winning 1st prize in the Edinburgh Area Branch ICE Paper Competition on 29th February 2012. "Recent engineering breakthroughs have assisted in an unprecedented growth in high speed rail speeds.These elevated velocities result in high amplitude ground vibrations that can propagate at large distances from the track.Such vibration can cause stress to local residents and possibly even structural damage.Therefore when drafting high speed rail plans, vibration effects on the surrounding environment must be considered. It is still unclear as to the effect embankment presence has on vibration propagation. Therefore, for the purposes of high speed rail design, this research develops a high accuracy, computationally efficient, 3D, fully coupled finite element model to analyse the effect soft and stiff embankments on far field vibration.The model is created using commercially available FEM software thus making it an attractive choice for high speed rail consultants.It is validated using in-field vibration measurements taken from a European high speed train passage. Finally it is found that stiff embankments provide superior vibration reduction, both near and far from the track." Also congratulations to Stefan Bozhkov, an undergraduate student in Civil Engineering, who won 3rd prize in the ICE Edinburgh Branch final for his paper entitled "Laboratory testing of concrete: mix design validation and composite behaviour". Please follow the link for the original flyer for the final.